House wrap is a breathable membrane system for house walls. Just like a breathable roof membrane, house wrap prevents water penetration while allowing water vapour to escape into the atmosphere. This reduces potentially damaging condensation. House wrap membranes work particularly well on timber framed walls. They are also very effective for steel framed buildings and concrete walls. The added advantage of house wrap is that it helps to make a building airtight. This is particularly important for helping to improve the energy efficiency of a property. One of the best performing house wraps on the market right now is Tyvek. Tyvek House Wrap is a lightweight, easily installed membrane which is manufactured from high density polythene. 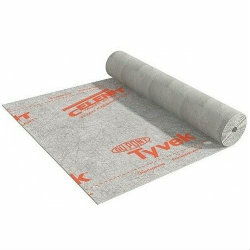 Although Tyvek is wind-tight and water resistant, microscopic gaps between its polythene fibres allow water vapour to pass out into the open air. If you have any questions about Tyvek or other breather membranes, please give us a call on 01629 828500.